We all know what a whistle is and how to use it. Most of us even had more than one piece during childhood, imagining that we were a referee coaching the football team. An emergency whistle is more than a toy; it’s a piece of equipment that could save your life in case of emergency. 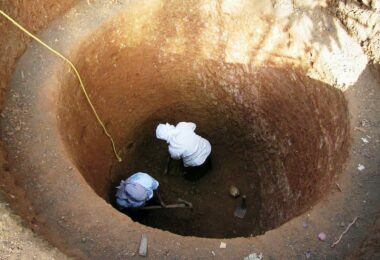 Let’s imagine the following situation: you are climbing a mountain with your friends and all of the sudden the earth moves under your feet and you disappear in a hidden ravine. Your voice is not strong enough to make it all the way through the surface and you are heart. How do you help your friends finding you when you can’t move or shout? If you have an emergency whistle with you the situation is saved! 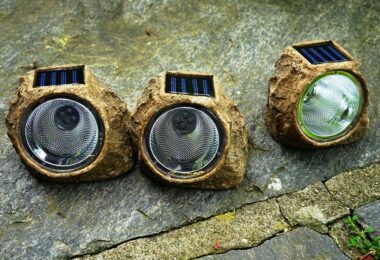 These things are built to resist a violent fall and they can be heard from long distances. By following the sound of your whistle your friends or a rescue team will be able to find you on time. Another emergency situation where an emergency whistle proves very useful is in case of a natural disaster. Floods, earthquakes and tornadoes come fast and they wipe everything in their way. If you are caught in a natural disaster and you end up trapped under a fallen building or you are caught inside the house without any hope of getting out, an emergency whistle can be your last chance. Rescue teams can’t hear your voice over all the noise made by rescue machines and general chaos but the sharp sound of a whistle is easier to perceive. 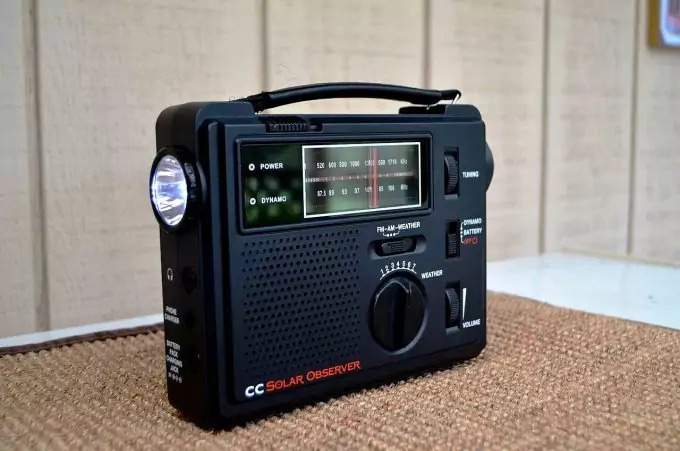 In this situation, it would be helpful to have a small emergency radio that has an ultra-sonic whistle built in like the MIDLAND ER300, more on the emergency radios you can read here. Regardless of the place and situation, you should always have your whistle: on the street, in the club, at a business meeting. You may never know when an emergency presents itself. A simple, lovely day that started absolutely regular can turn into a nightmare in a matter of seconds so don’t count on the fact that you have an emergency whistle somewhere, at home. Keep it handy, not at the bottom of your big purse or suitcase. Let’s say that you walk down the street and some thugs pull you in a corner and ask for your money (or worse). If you have your whistle at hand you can make yourself heard and maybe you have a chance at getting out of this situation safe and sound. 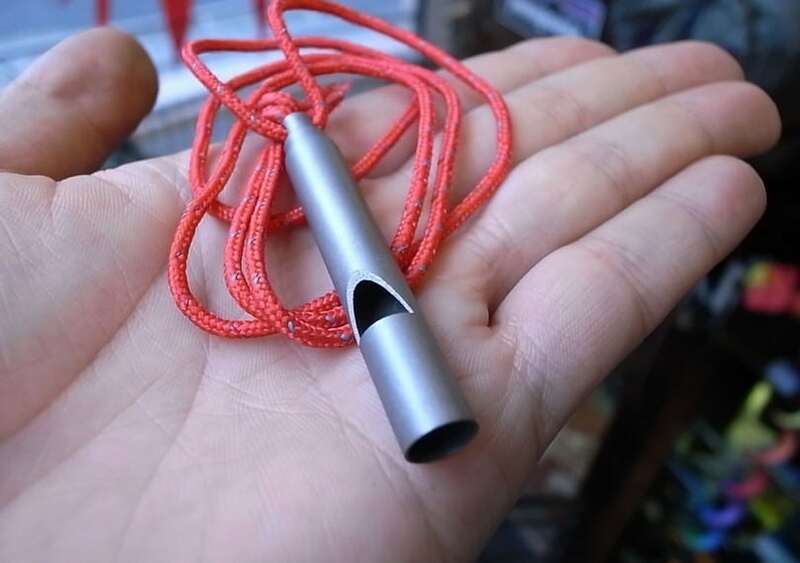 Survival situations: as you could see from the mountain climbing story, carrying a whistle with you when performing outdoor activities is a cheap and simple way to help other people find your location. Three short whistle blasts is internationally recognized as a distress signal so make sure to remember that when in need of help. 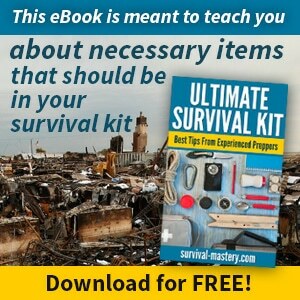 We also have a very interesting list of gear items to have in case of a survival situation so go ahead and take a look. Natural disaster situations: when a natural disaster strikes you’d better be prepared as they don’t like to wait. Having an emergency whistle with you is part of your basic disaster preparedness. Again, if you need to let rescue teams know that you are harmed and unable to move, this little piece of equipment can bring them to you. Crime prevention: here we make reference to the thugs story we talked about earlier. These guys try to operate in absolute discretion and they don’t like to draw attention. A whistle blow will definitely blow their cover and they can’t use it against you like it happens with a gun or other defensive weapon. If you want to learn more about urban survival, take a look at our article on this topic. Scare animals: dogs have very sensible hearing and high notes from the whistle will frighten them. This is extremely useful when you worry that a dog might want to bite you. No one wants to be in a bad situation but these things happen. It’s better to be prepared and this small device is a first big step to your preparedness. Try to put it at your key chain or car keys in order to have it in handy. Also teach your children about how and when to use them. Many child abductions didn’t happen because of these little things. It’s time to start thinking about your safety and the safety of your loved ones! Stop thinking that nothing bad can happen or if something is to happen, someone will be there to help you. Be responsible for your self defense! A good emergency whistle will be heard over ambient noises for a long distance letting people know that you are in trouble. Also it will never fail. A GPS system can run out of battery or lose satellite signal, a phone also can lose signal or drop dead without a charged battery, but a whistle will always be there for you. Looking for an emergency whistle can be a little bit intimidating given the fact that there are a lot of offers on the market. Producers love to praise their products and try to convince you that theirs is the best. If you don’t have the basic information you might choose the wrong one. It has to be loud and you don’t have to put in a lot of effort when you blow it. You never know when you are going to end up hurt and you can’t blow the whistle using your maximum lung capacity. The whistle must be able to produce a high-pitched, penetrating sound that is going to be heard for a long distance and over other noises. It has to be resistant. You never know in what type of situation you can end up so you need a whistle that resists to freezing and deteriorating. Regular whistles need certain conditions in order to function properly but when it comes to emergencies you can’t be picky about conditions. You need a whistle that will work as fine in Antarctica as it will on the bottom of an abyss. Also make sure that the material is resistant to shocks. If you fall and it breaks you won’t be able to use it. Don’t buy metallic whistles if you go in a cold temperature environment, it will stick to your lips. It can’t jam or be overblown. Our recommendation is to choose a pealess whistle. Due to the fact that they don’t have any moving parts this type of emergency whistle will not get jammed and it cannot be overblown. The harder you blow, the louder the sound is going to be. A whistle with a pea loses its efficiency as dirt and moisture get inside. If the pea gets stuck then the sound won’t come out anymore. With a pealess safety whistle you don’t have to worry about this anymore. It’s easy to find. A whistle is a small thing that can be easily lost. That’s why you need a whistle that you can attach to something or simply wear it around your neck. There are many whistle designs that allow you to wear it as a bracelet or even a ring in order to have it close to you all the time. Make sure that, if you wear it around your neck, you use a lanyard that will break under pressure. You can also learn how to make a paracord lanyard if you want something more special. You don’t want a thug to use that against you and end up strangled with your own lanyard. A vividly colored whistle will also be easier to find when looking through a pile of small things. Try bright orange or phosphorescent green, these are the colors most easy to spot. These are the main characteristics you should be looking in a safety whistle. 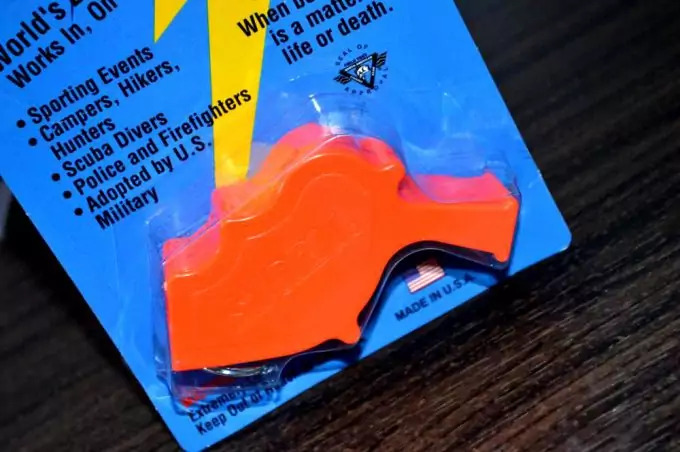 Now we’re going to talk about a few emergency whistles that we trust and consider efficient enough as to recommend them for our readers. 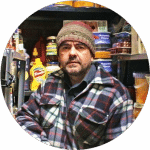 In this section we are going to talk about some of the best products on the market and let you know our opinion and the one of the people using them. This way you’ll definitely know which one you like the best. 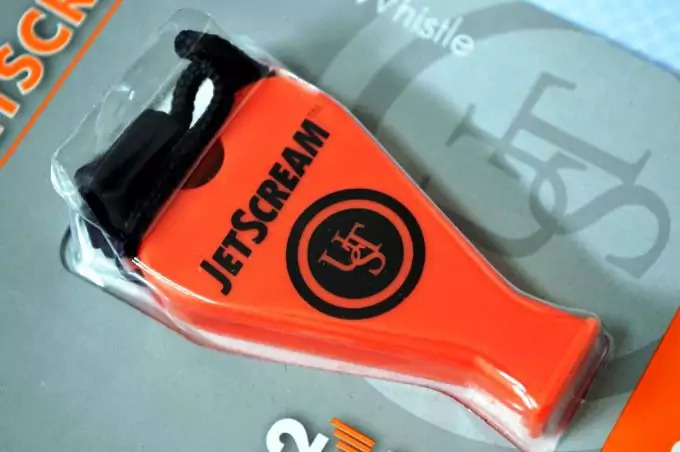 This is a very loud whistle (it can get up to 122 decibels) which is why we decided to put it on top of our list. You can say (without being wrong) that this is one of the loudest whistles in the entire world. Its shriek goes over noises we usually deal with daily like talking, walking, park noises, driving a car or even and industrial turbine. People who have tested it all agree that their ears were still ringing a day after blowing this whistle, that loud it can be. It’s the perfect pal when you go in an adventure or when you send your kids alone to school. A blow in this whistle will definitely attract all the attention around. It’s easy to carry in your pocket, on your key chain or around your neck due to its compact design. The only disadvantage to this whistle is your lung force. If you really want to make it up to 122 db you need to put your entire strength in it. Anyways, if you can’t get it that loud, the sound will still be heard on a long distance. This is the whistle to have when something bad happens. The Storm All Weather is another great emergency whistle that can qualify for the loudest whistle in the world award. It is so loud that people who tested it had to cover their ears while blowing it. Some even decided to add a pair of ear plugs to their emergency kit just in case they need to use the whistle. 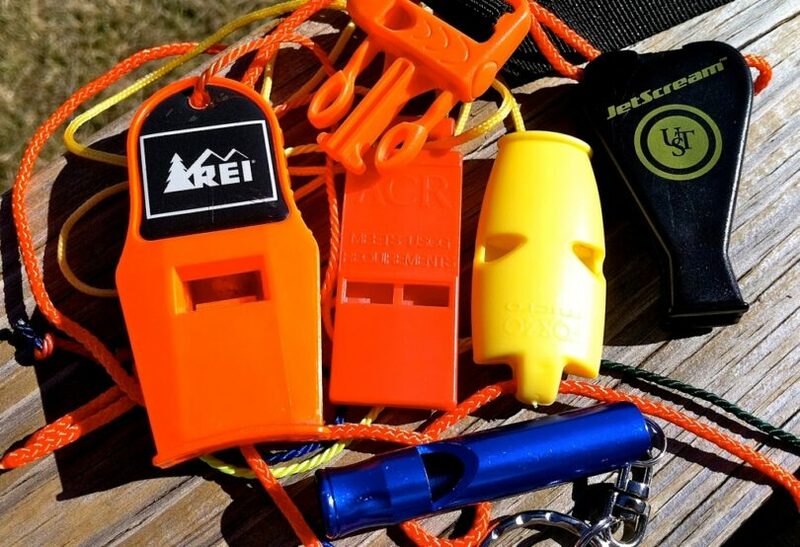 By the way, we have a list of emergency kits that include emergency whistles. With this kind of whistle at your disposal you don’t have to worry that people won’t hear you. 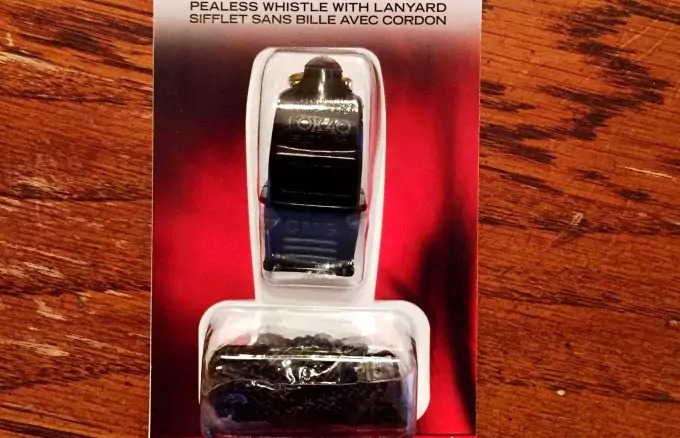 The only complain people had regarding this whistle, is that it is too loud. In this case, when the negative review is actually a highlight of whistle’s best quality, you know you found the right one. Take it with you wherever you go. It might save your life. The Fox40 Sonik Blast CMG is an amazing whistle for any situation. You can use it as a lifeguard, as a referee or in case of emergency. Besides being loud, its main advantage is that it is very easy to blow. Even a person with asthma can blow this whistle to its maximum potential. Also the rubber band at the bottom makes it extremely nice to use. Your lips won’t stick to the material and you can clean it very easy. Due to its compact design, material and color, the Fox40 Sonik Blast CMG is one of the emergency whistles we would recommend anyone. It’s very easy to use and hard to mess it up. This whistle is made out of the toughest and lightest material on the planet: titanium. Due to its composition, the whistle will not break regardless of the situation and age. 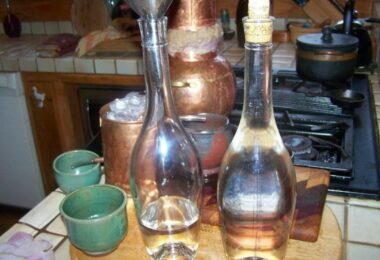 Also the Vargo emergency whistle is a pealess design, which means no jamming. The sound this whistle produces goes to 100 decibels and higher. it is resistant given the fact that it is made out of titanium. The main complaints this whistle registered were the fact that it is not made out of one single piece. There is a small plastic part inside that, if it falls, the whistle won’t work anymore. Also the cord is a bit rugged on the skin if you wear it around your neck. These are the main products we would recommend anyone who is interested in having some extra help in case of an ugly scenario. Of course that there are other amazing whistles on the market and if you are happy with the one you already have, there’s no need to change it. Just make sure you can be heard over ambient noises. The best way to test your emergency whistle is to go in a loud environment like a park filled with kids running and screaming. Take a friend with you and make it stand at the other end of the park with its ears wide open. Blow the whistle as hard as you can and ask the friend if it heard it. If the answer is affirmative then you got yourself a keeper. Children usually make loud noises and have high-pitched voices, which is why you should test your whistle there. If it can be heard through that, a rescue team will definitely hear you. The final conclusion here is that emergencies can happen at any given moment of the day or night and you need to be prepared. An emergency whistle will definitely get you out of a lot of troubles so when you find the one you like, keep it close. Also give it to your children and wife and tell your friends about it.